Attract wrens, chickadees, and other songbirds to your bird garden by mounting the Heartwood Redwood Cape Cod Wren House in it. 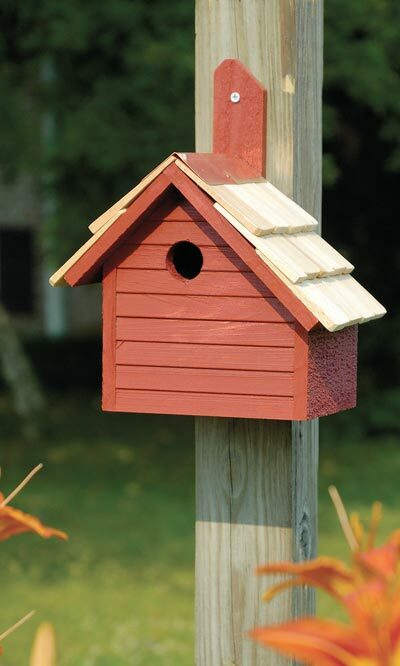 This adorable roost is perfect for small songbirds, and is one of the most popular and durable on the market. The cypress body and shingles will surely last for years, aging beautifully along with the copper ridge cap. The soft red finish captures attention, and a copper cleanout disc on the back of the shelter offers easy seasonal maintenance. Proper drainage on the base ensures the nest remains dry for nestlings, and its thick wood body keeps it well insulated. Place this home on a post with its hanging tab for an eye catching statement. Turn your backyard into a songbird retreat with this Redwood Cape Cod Wren House. Handcrafted in the USA. Availability: 1 in Stock. Ships from OH within 24 business hours , 1 available at this price!